So, this is the end of day one. I would be telling you about this on the internet already, but it seems that my mobile phone provider has no love for the town of Norseman, and my SIM card has been involved in a falling out with other phone networks, and they are refusing to speak to each other. Thankfully though, I have made it here after all, so I can’t complain too much. After a delayed start to the morning thanks firstly to my whacking of the accursed snooze button on my alarm, followed by the sheer act of will that was ignoring the alarm then going off for a solid ten minutes, I was three hours behind schedule by the time I finally flopped out of bed. The upshot of this is that I missed having to deal with city peak hour, but otherwise it was a bad sign, as I needed to travel vast distances before sundown. The weather began by looking quite ghastly, at least as ghastly as is possible without things falling from the sky, but the further I made my way inland from the coast, the more pleasant it became. By the time I had reached the outskirts of Toodyay, daylight was clearly visible, which I can assure you was greeted with much rejoicing. After stopping in Cunderdin where I purchased some fuel from an establishment run by a gentleman named ‘Dougie’ (who despite also being in the pizza business, had no tips to give me), I proceeded on East toward the first of two turns I had left to make for the day. Along the way two gentlemen sporting well-cultivated moustaches and uniforms of the Western Australian Police force were kind enough to evaluate the accuracy of my speedometer for me, and escorted me to the side of the road to advise me so. Such activities do not come for free of course, but it’s one of many services that they provide. A short while later I stopped at Southern Cross for yet more petrol, and then headed again off down the Great Eastern Highway, which although a road with a single name, can involve anything from billiard-table-smooth blacktop, to compounded pea gravel with white lines painted on it. 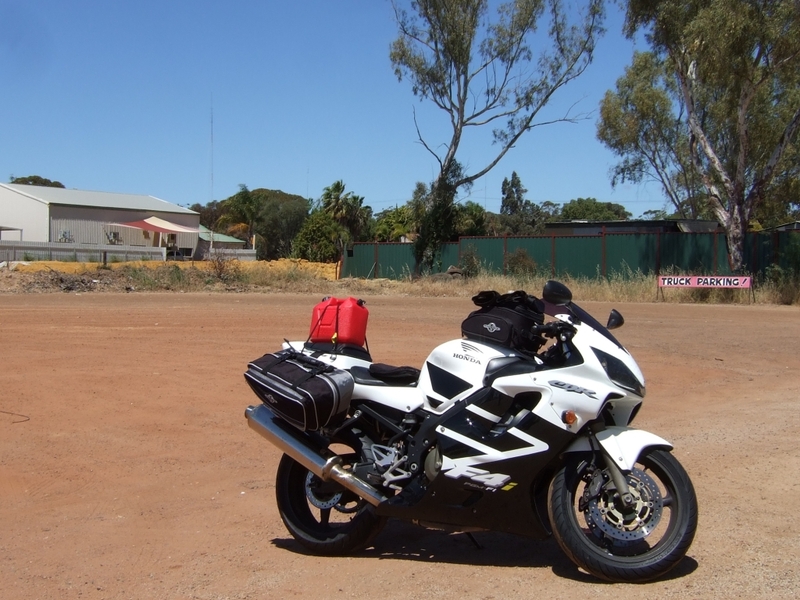 After humming the chorus to Rocket Man in my helmet for a good forty minutes or so, I managed to change tunes several times before eventually making it to Coolgardie, where after more refuelling, I made a turn. By this point the Ghost Gums were casting long shadows across my path, which aside from the rapidly descending sun, meant that I should be extra vigilant for kangaroos or other wildlife who have lost the will to live and have the habit of running across the road in front of moving vehicles. Thankfully the only wildlife I saw all day that was not secured in a paddock was limited to a number of birds and several pieces of roadkill of indeterminate species. As a glorious sunset was occurring to my right while I was covering the last of the road leading into Norseman, I slowed down after seeing another motorcycle on the side of the road, followed by my noticing three cars parked on the other side of the road, followed by my noticing a small green hatchback further off the other side of the road and partially into a tree. After being assured that everything was alright and that an ambulance was on the way, I kept on moving, passing the emergency services headed the other direction a couple of minutes later. 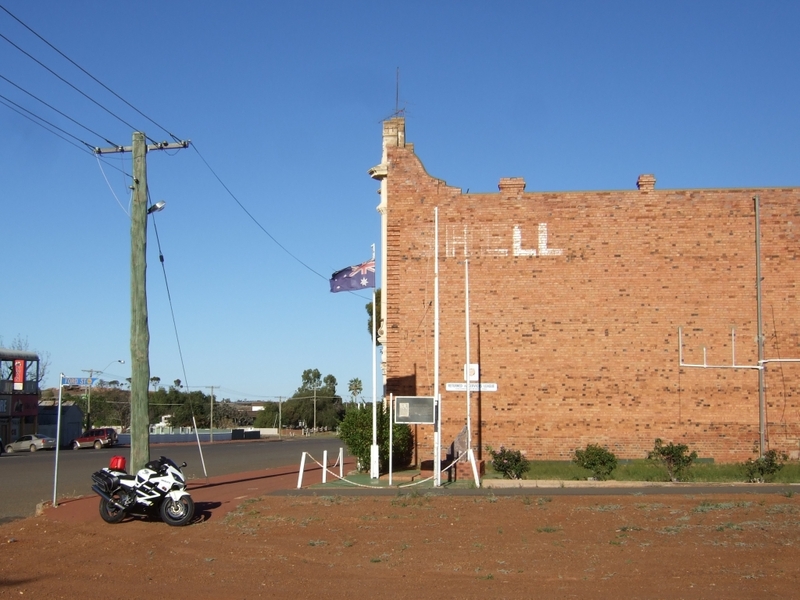 I managed to pull into Norseman just as the last of the light was fading, and after trying two petrol pumps that had no interest in supplying me fuel, found a third which was more accommodating and scooted off down the road to dump my belongings and person at the motel. While I don’t remember taking any shortcuts, today’s tally was 685.8km, which is a good deal shorter than the 736km that Google Maps tells me it should take me to cover the same roads, and no, I didn’t cover any sections in reverse. To top off the day was the wonderful suprise that while my room’s shower not only dispenses water downwards, but directly sideways and even up and backwards from the shower head, it dispenses truly hot water, and bountiful quantities thereof. This is one of those things in life for which I have learned to be deeply grateful. Tomorrow is set to be the longest and most strenuous of riding days, along with being the least interesting in regards to the lay of the roads. 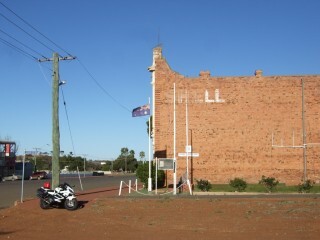 My directions for tomorrow read: “Go 1.4km North-West along Coolgardie-Esperance Highway, Turn right at Eyre highway. Travel 1200km. Stop at Highway 1 Motel, Ceduna.” I may have to put in some effort if I wish to get myself lost.